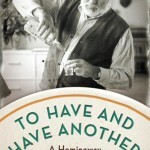 In his introduction for To Have and Have Another: A Hemingway Cocktail Companion, author Philip Greene quotes Ernest Hemingway, who said, “Don’t bother with churches, government buildings or city squares; if you want to know about a culture, spend a night in its bars.” Few people have explored the world by brass rail with more enthusiasm than Hemingway, whose prodigious thirst helped enrich scenes throughout his books, from Jake Barnes drinking a Jack Rose in The Sun Also Rises to Robert Jordan and the ritual of dripped absinthe in For Whom the Bell Tolls. Greene, who serves as Trademark and Internet Counsel for the U.S. Marine Corps by day, is a cocktail historian, spirits consultant, and co-founder of The Museum of the American Cocktail. He’s a descendant of the Peychaud family of New Orleans, and among his ancestors is Antoine Amédée Peychaud, the nineteenth-century New Orleans pharmacist whose namesake bitters are an essential ingredient in a Sazerac. Bringing twenty-plus years of research to bear, Greene describes recipes for over fifty cocktails, from the earliest drink that Hemingway ever wrote about (Cognac & Bénédictine, from an unpublished story) to those mentioned in posthumously published works (Sangria, Scotch With Lemon & Wild Strawberries). Along the way, Greene reveals Hemingway’s favorite cocktails, spirits, and the drink that made the most appearances in his prose. There’s even a children’s story titled The Good Lion, in which the titular character prefers Negronis and Americanos to drinking human blood. Greene offers suggested reading along with each recipe, such as The Sun Also Rises (Chapter 11) and A Moveable Feast (“A Good Café on the Place St.-Michel”) for Hot Rum Punch. Classic cocktails of course get their due, including lengthier chapters focused on the Martini and the Daiquiri. Greene makes a strong case against the long-held notion that the Mojito was Hemingway’s favorite drink. But what about the famous handwritten note, framed and displayed behind the bar at La Bodeguita del Medio in Havana: “My mojito in La Bodeguita, my daiquiri in El Floridita.” Likely a forgery, or perhaps signed by Papa to settle a bar tab. In addition to cocktail recipes, Greene unearths some of Hemingway’s unique ways of enjoying them. The chapter entitled “Carburetion” describes a method of experiencing cognac that Hemingway learned from Pan American executive Grant Mason, and the subsequent three-day party in which Hemingway and his companions went through three dozen cases of cognac while teaching the technique to the residents of a Havana suburb. Greene transports the reader to Hemingway’s time by including many never-before-published photographs of Papa, as well as vintage cocktail menus and advertisements. And to help build a Hemingway bucket list, Greene gives background info on some of Hemingway’s favorite bars, including Harry’s Bar, Captain Tony’s, Sloppy Joe’s, and the Ritz Paris. Approachable enough for the newbie, yet exhaustively detailed to entice cocktail enthusiasts, history buffs and Hemingway aficionados, To Have and Have Another is a wonderful read that’s destined to find its way to a wide array of bookshelves. 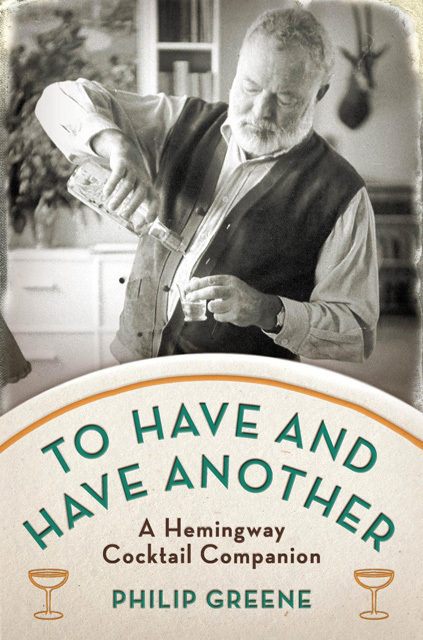 To Have and Have Another is filled with stories of Hemingway carousing with everyone from fishing companions in Key West to famous writers like F. Scott Fitzgerald, with whom he took a memorable road trip in his younger days. One of the fellow imbibers mentioned in the book is none other than Charles H. Baker, Jr., the famed bon vivant and author of The Gentleman’s Companion, a classic, two-volume culinary and cocktails travelogue. * Two of Hemingway’s cocktails are featured in the second volume, one of which is Death in the Gulf Stream (Ernest Hemingway’s Reviver). Greene writes that Baker and Hemingway, who were both contributing writers to Esquire magazine, became friends during the latter’s Key West years. Baker and his wife Pauline, feeling a bit rough after a couple of days visiting Hemingway in Key West, were restored thanks to Papa’s “picker-upper,” named as a nod to his 1932 non-fiction book on Spanish bullfighting, Death in the Afternoon. It’s easy to see why the Death in the Gulf Stream won over the Bakers; the malty Bols Genever provides the anchor to a bright, tart and bitter long drink that can bring anyone back from the brink. “Take a tall, thin water tumbler and fill it with finely cracked ice. Lace this broken debris with 4 good purple splashes of Angostura, add the juice and peel of 1 green lime, and fill glass almost full with Holland gin.” ~ From The Gentleman’s Companion Vol. 2 by Charles H. Baker, Jr.
*The Gentleman’s Companion has been republished as Knife, Fork and Spoon: Eating Around the World (Volume 1) and Jigger, Beaker and Glass: Drinking Around the World (Volume 2).